You know those days when you wake up and just wish you didn’t have to get out of bed? When, as much as you love your children with all of your being, you wish your responsibilities would disappear for a little while and that you did not in fact have to do the school run or be solely responsible for another humans life, entertainment, food, everything, for the next 12 hours. Not to mention the bedtime that will end those 12 hours peacefully. You hope anyway. Well I’ve had a couple of those this week from a headache I cannot seem to shift. I’m not really ill, I’m not sick or feeling so dreadful that I can’t move or anything quite as dramatic. I mean I’ve had pneumonia previously and still parented, now that was rubbish. I’ve just had this really bad headache that has taken me off my game and taken all of my brain power and entire thoughts the last couple of days. And today, Saturday, was no exception as I went into another day on my own. You see Eddy who is a HUGE football fan. And by that I mean he knows more about football than I have ever known anybody know about anything, even more than I know about Friends (the tv show, not my actual friends!) and that is ALOT! He has a huge passion and as we live in Staffordshire and he supports Everton it isn’t that often he gets to go and watch the beautiful game (his words not mine I might add) anyway so today he was to spend the whole day out at football and I would never ever begrudge him that. I guess it was just a bit of bad timing and meant I was on duty. With this is mind I got a lie in until 9am (where I hoped to open my eyes and be fine but was greeted with the familiar searing headache as soon as I awoke) to the sight of my family bringing me breakfast in bed none the less so really I couldn’t complain. 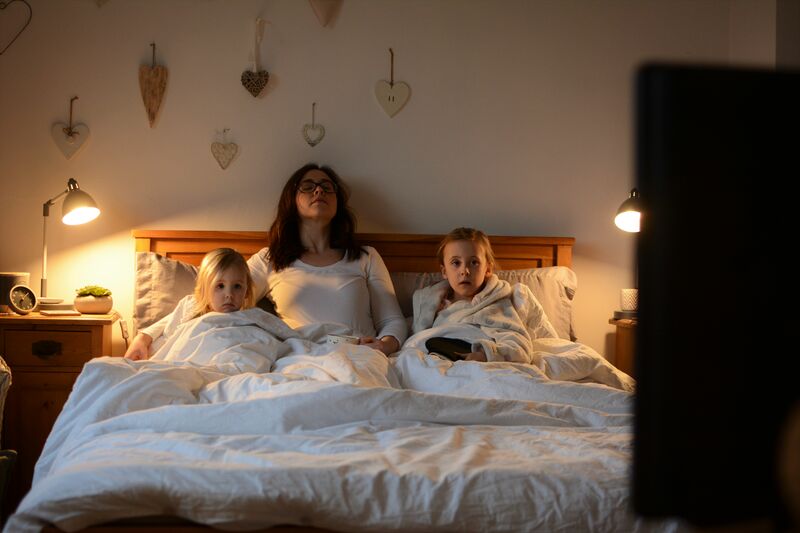 And there it was, in my quest to make January a positive one I decided to make the most of a less than ideal situation and with the rain outside it was a perfect chance for a snuggly film afternoon, not just for them, but with them. Yes I had to endure the food shop in the morning but I rallied my sister in on that one and we laughed at how the girls raced to help choosing the exact same item off the list despite me giving them choices (I had to keep a watchful eye before I drowned in apples, bananas and garlic!) People smiled at their nature and our sarcastic comments and looks to each other and it was ok. I had her to help. Once I dropped her off we not only put a film on but at the girls request had a ‘get in our pjs and lay on Mummy’s bed to watch it’ kind of afternoon. It was so lovely, I still felt like I spent time with them whilst they felt like it was a treat so really it was win win. There is a big benefit in the fact that we don’t watch much television in the fact that they then get excited for a treat and to do that together. Albeit on the smallest tv in the world! I felt this strange sense of Motherhood in that moment that is rare for me. I was able to see the moment from their eyes, to walk in their shoes and know that in this scenario they weren’t thinking ‘this is awful because Mummy isn’t feeling well and so has put the TV on to shut us up’ (which may well have been half true) but in actual fact thinking ‘wow we get to watch a film and cuddle my Mum with no distractions’. It was like a revelation. So often I strive to keep going, to forget myself and put them first which either ends up me feeling frazzled, burnt out and unappreciated because they have no idea what I am sacrificing. Or having a bad time anyway or losing my temper and feeling awful because it isn’t their fault and I have no-one else to blame but myself. Oh the mum guilt. Today as you read this I have a birthday party with Roma followed by a play date with Eva, if I wake up with the headache again it will be one of those days where I just keep going and it will be fine I know it will, however sometimes I am realising that it’s ok to put me first too and that maybe, just maybe it is actually better for everyone. Because I really feel like today we made a memory, a really good one and that this will be the time that they remember. That maybe when I am poorly, or they are poorly it’s about making the best of a sick day and loving it despite that. I may still be feeling under the weather, I may look truly awful in these photos, but the fact that I am not racked with guilt and have come out on a positive note for both me and the girls, is pretty darn amazing to me. These aren’t glamarous pictures, nor would I say they are dramatically sad pictures, they are just moments in time captured as I tried to make the best of a sick day and these are what you get. Except the attempt for a nap, that wasn’t caught on camera and nor was Roma shouting “it isn’t night time you know” right in my face. Mum Life! This last one really makes me laugh because we all look like we are having the worst possible day ever, we have the same dead pan expression and I love it! Clearly this is what we look like when we are watching a film and quite possibly the reason that cinemas are made to be dark! I could not love these two gorgeous gormless faces more if I tried. Next Post Merlin Annual Pass – Is It Worth It? Oh, that last photo of you all is so funny, I love it! 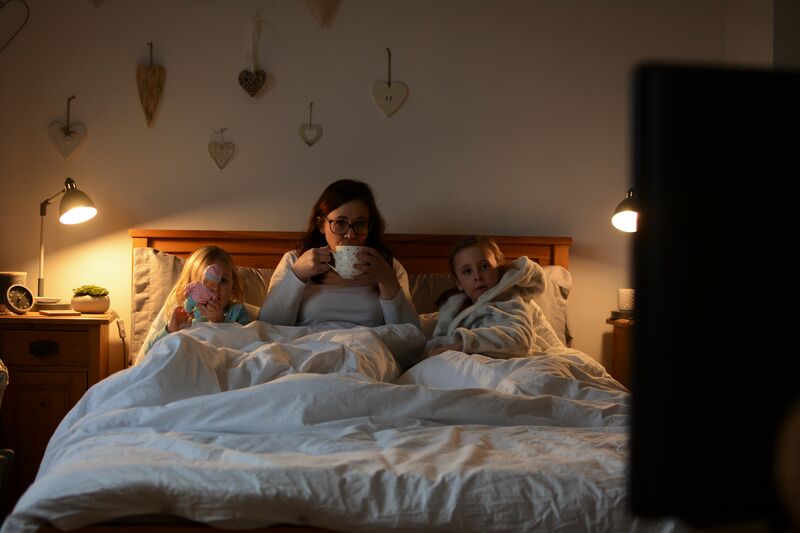 I love this post too, it’s so true – I had quite a few of these days while I was pregnant, and Max and I would camp out in my bedroom and he’d watch a film and cuddle while I intermittently threw up. I used to worry about how bored he was, but actually, he loved the treat of being in our room, and quite often we’d snuggle together and both doze off, which was a really lovely moment, even in the midst of the awfulness of the sickness. I really hope you feel better next week. And yes, it’s definitely very important (and in everyone’s best interests) to sometimes put yourself first! Don’t be racked with the Mum guilt on this one, easier said then done, but you needed to put yourself first and get better. 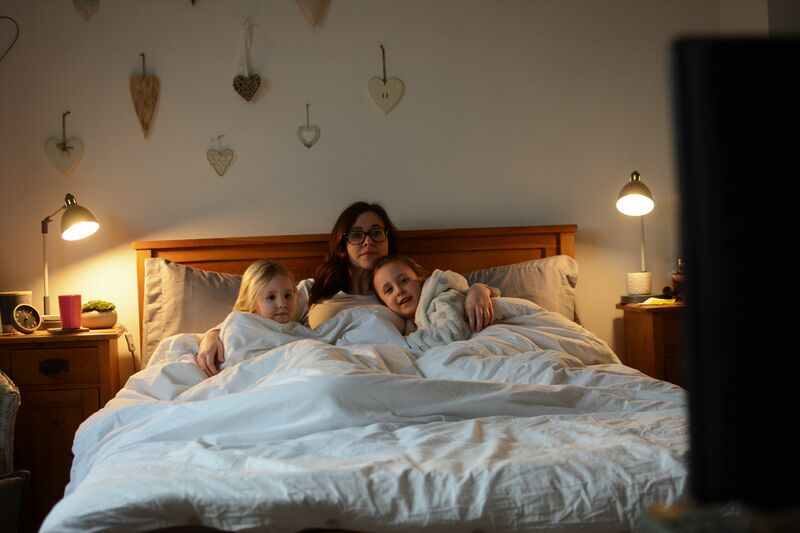 You managed to turn it around for the girls and I bet they really enjoyed it anyway, who doesn’t love a snuggly duvet type day.